We’ve all been there! We’re interested in preparing healthy snack and meals at home. But, we don’t have all the right tools. It seems like in order to get ourselves back in shape, we have to spend a lot of money getting our kitchens back in shape too. Based on the foods that wreak the most havoc on our waistlines, there are only a few essential items that you need in order to update your kitchen and lighten up your cooking. Salad dressings are one of the most commonly overused foods. If we’re eating a salad, it’s healthy, no matter what we top it with, right? The truth is that salad dressings hide a lot of empty calories. So, limiting the amount used on a salad is a great way to cut back on overall calorie intake. Reusable dressing lids that measure portions make it super easy to watch portions and still enjoy your favorite dressings. This tool is also great for kids as they learn how much dressing they should be using on their salads. I don’t know about you, but in my house pasta is a staple in many of our meals. It offers a great base for many vegetables and proteins. The key with pasta, like with any other food, is to keep an eye on your portions. 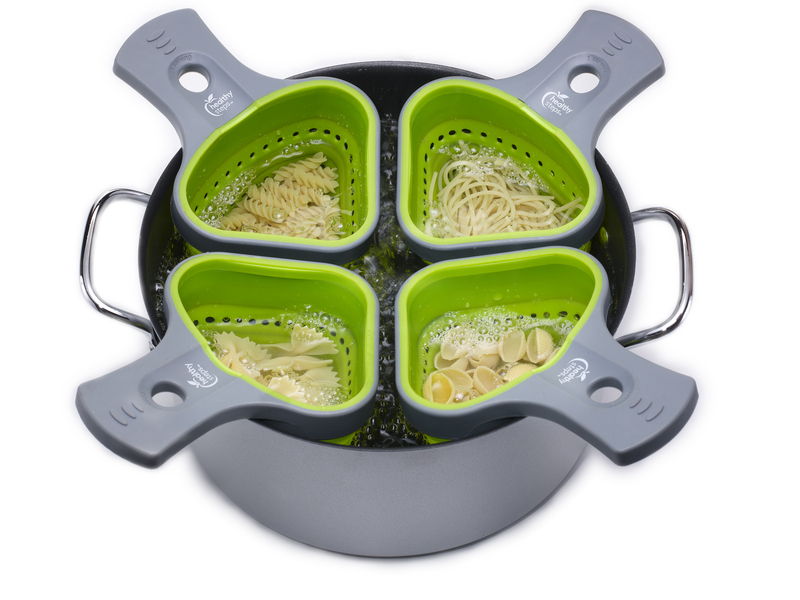 The Healthy Steps Pasta Basket is perfectly sized for an individual portion. Plus, it hangs on the side of your pot of boiling water for easy draining when the pasta is done and collapses flat for easy storage after use. Truly, it doesn’t get much easier than that! The Perfect Portions Food Scale also makes keeping an eye on portions easier. Not only will it weigh your foods before you add them to your favorite recipes, it will also give you the nutrition information for that food, including calories, fat grams, protein and much more. It’s like having your own personalized nutrition label for any amount of any food! The best way to add flavor to any dish is by using fresh herbs. Cooked in to your favorite recipe or cut fresh on top of a salad, herbs are a great low (or no) calorie addition. If you don’t use them quickly enough though, they tend to go bad. The Herb Savor Pod stores them neatly and also helps to keep them fresher longer, prolonging their life by up to 3 weeks. And, finally, no healthy kitchen is complete without this hands-free countertop tool, the iPrep iPad Holder. As technology changes, printed cookbooks are quickly becoming ‘so 1995’. In their place are online recipes, meal planning sites and digital cookbooks. What’s better to access them from than an iPad? But, those mini computers aren’t cheap so you don’t want it setting on your counter with all of your ingredients while you’re cooking. Instead, have it safe and secure in the iPrep holder for easy recipe viewing. It also comes with a stylus so you don’t have to touch the screen with dirty, meal prepping hands. It’s basically the cookbook holder of 2014! Cooking healthy meals can be a lot of work. However, with the right tools, you can really simplify the process. The Wellness Spot, backed by NCES, offers an entire line of products just like you’ve seen in this blog. We chose these five as essentials for every healthy kitchen, but there are many more available to browse through by category. If you have any ideas for healthy products that should be featured on The Wellness Spot, send them in and we’ll see about getting them added. We hope you enjoy your new tools and your healthier kitchen!